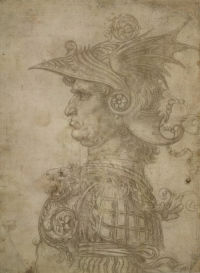 This drawing in metalpoint of an aged warrior seen in profile, wearing fantastical armour in the classical, roman style, conforms to a particular type favoured in the workshop of Verrocchio. It is based on a relief of the Persian King, Darius, by Verrocchio himself. It is possible that young apprentices practised their drawing skills by executing such studies. The finely rendered details of the costume and the skilful modelling of the face indicate the astonishing range and virtuoso handling of Leonardo’s metalpoint technique at presumably a young age, a skill no doubt acquired in the workshop of Verrocchio where drawing played a vital role in the training of young artists.